Pantherella is an English company, which manufactures socks. It was established in 1937 as Midlands Hosiery Mills; Pantherella brand has been used since 1945. All Pantherella socks are made in England. They usually feature hand-linked toes (as far as I know, some exceptions exist). There are mid-calf, over-the-calf and invisible socks. Pantherella uses 70% superfine merino wool (19.5 micron or even less) + 30% nylon; 70% Escorial wool + 30% nylon; 70% silk (2-, 3-ply) + 30% nylon; 70% mercerised cotton + 30% nylon; 75% long staple Egyptian cotton (Giza 86, spun and dyed in Italy, 2-ply, mercerised) + 25% nylon; 80% Sea Island cotton + 20% nylon; 31% Egyptian cotton + 44% linen + 25% nylon; cashmere + nylon blends. 100% cashmere socks are also available. Pantherella socks are knitted by machines with up to 240 needles (but the brand also sells heavy socks made by machines with 96 needles). Pantherella offers a very wide range of patterns and colours: herringbone, argyle, pin dots, ‘diamonds’, horizontal stripes, birds’ eye, fair isle, solids; black, brown, red, blue, utramarine, navy, burgundy, racing green, grey, dark grey, charcoal, purple, light pink, etc. Sizes: S, M, L, XL (fit UK5 – UK15) or 10 – 13 (fit UK5 – UK14). You can buy Pantherella socks at Pantherella.com, MrPorter.com, Quality-Shop.com, MatchesFashion.com, WoodsofShropshire.co.uk, Shop.Nordstrom.com, SockShop.co.uk. Prices start at 11 EUR (invisible socks, excl. VAT) or 9 GBP (invisible socks, excl. VAT). Sometimes these socks are put on sales (discounts up to 50%). Monogramming service is available at Pantherella.com. Pantherella socks. 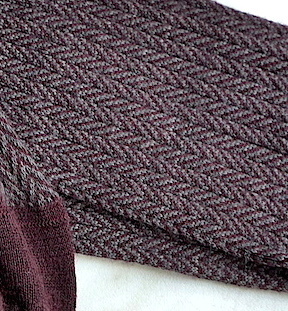 70% merino wool + 30% nylon.